The 1950s have become something of a lost decade in historical recollections of postwar Japan. It is not difficult to understand why. The “‘50s” were overshadowed by the dramatic U.S. occupation that followed the country’s defeat in World War II, lasting until 1952. And they were eclipsed by what followed: the “income doubling” policies initiated in 1960 that, for the first time, drew international attention to Japan’s economic reconstruction. In fact, this was a tortured and tumultuous decade. Bitter memories of the recent war that ended in Hiroshima and Nagasaki folded into the spectacle of a cold-war nuclear arms race and a hot war next door in Korea (extending from 1950 to 1953). The continued post-occupation presence of a massive network of U.S. military bases provoked enormous controversy, as did the conservative government’s commitment to rearm Japan under the U.S. military aegis. Former leaders of Japan’s recent aggression returned to the political helm—symbolized most dramatically by the 1957 elevation to the premiership of Kishi Nobusuke, an accused (but never indicted) war criminal. “Reportage painters” was a loose label attached to left-wing artists of the time who rejected conventional aesthetics, while bearing witness to unfolding military and political events. The artwork they produced in the 1950s and early 1960s is now largely buried in museums, and even in their own time they had few opportunities to exhibit their work, and found few patrons willing to buy it. 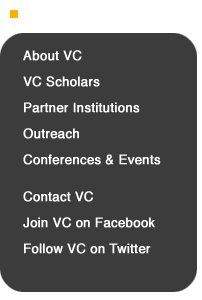 Yet their vigor, vision, integrity, and originality are extraordinary. In their distinctive ways, the four reportage artists introduced here open a stunning window onto these turbulent, neglected years. This Visualizing Cultures unit complements Linda Hoaglund’s prize-winning 2010 documentary film “ANPO: Art X War.” The acronym ANPO, familiar to all Japanese of a certain age, derives from the Japanese name of the bilateral U.S.-Japan Treaty of Mutual Cooperation and Security, under which Japan committed itself to rearm and host U.S. military bases. In Japanese parlance, reference to the “ANPO struggle” usually focuses on the protests against renewal of the security treaty that convulsed the nation in 1960, culminating in riots in Tokyo. The “forgotten reportage painters”—this unit’s subtitle—convey the deeper history of this passionate anti-base, anti-rearmament, anti-corruption protest movement. “ANPO: Art X War” was screened in numerous international forums in 2010 and 2011. 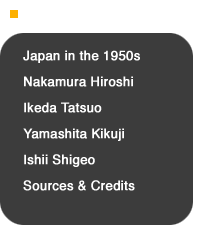 The documentary was honored in Japan with a nomination by the Agency for Cultural Affairs for the 2011 Best Cultural Documentary Prize, and in the United States by the 2012 Erik Barnouw Award of the Organization of American Historians (for “significant visual contribution to the history of American international relations”). 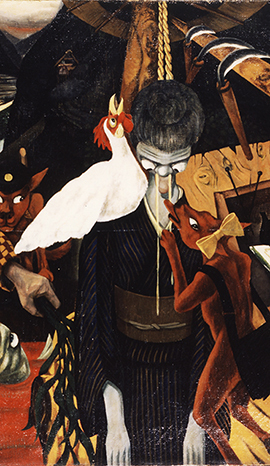 In 1958, Nakamura Hiroshi, one of the artists featured in this essay, produced a surreal painting titled “The Civil War Era,” referring to the situation in Japan. His original title had been “Postwar Revolution,” but Nakamura decided this exaggerated the situation. “Civil war,” on the other hand, suggested a kind of purgatory between war and peace, in which the struggle involved nothing less than whether Japan could become a truly peaceful and democratic nation if it remained locked in the military embrace of the United States. Like many of his compatriots, Nakamura was severely critical of the conservative governments that had dominated Japanese politics since 1948 and negotiated the terms under which Japan regained sovereignty in 1952, after six years and eight months of being occupied by the U.S.-led victors in World War II. As the political left saw it, the price paid for nominal sovereignty was bogus independence. Under the bilateral U.S.-Japan security treaty that was Washington’s quid pro quo for ending the Occupation, Japan agreed (1) to rearm under the American aegis; (2) to allow U.S. military bases throughout the country; (3) to surrender de-facto sovereignty over Okinawa, which had become America’s major “forward” projection of military power in Asia; (4) to rely on the U.S. “nuclear umbrella” for security; and (5) to acquiesce in the economic and political “containment” of China, where the Communists had emerged victorious in 1949. Most of the conservatives who endorsed these conditions agreed that the security treaty and its supplementary bilateral agreements (extending into 1954) were inequitable. It was widely acknowledged that the United States obtained more extensive military rights and privileges in sovereign Japan than it had demanded from any of its other cold-war partners. Given the global situation, however, the conservatives saw no alternative to paying a high price to escape the humiliation of protracted occupation. The Soviet Union had tested its first nuclear weapon in 1949, the same year that the People’s Republic of China was established. The Korean War had erupted in June 1950—drawing in both the U.S. and subsequently China, and dragging on into 1953. A mere five years after Hiroshima and Nagasaki and the end of World War II in Asia, American strategic planners had come to regard Japan not merely as an indispensable military base, but also as the projected “workshop” of the non-Communist Asian world. Even the staunch anti-Communist and pro-American political leader Yoshida Shigeru, who served uninterruptedly as prime minister from late 1948 to the end of 1954, regarded Washington’s cold-war demands as excessive. He was willing to trade Okinawa for American guarantees of protection, but did not welcome extensive U.S. bases in the main islands of Japan, did not support the isolation of China, and regarded Washington’s demands for rapid rearmament as particularly foolhardy while harsh memories of Japan’s recent militarism were still vivid, domestically and among the nation’s neighbors. In a reflection on the state of the country written shortly after he left the premiership, Yoshida employed language analogous to Nakamura’s evocation of “civil war.” An ideological “38th parallel” had split Japanese society in two, he observed, taking his bleak metaphor from the post-World War II division of Korea. It was the hope and expectation of Yoshida and his fellow conservatives that the most grating and blatantly inequitable aspects of the U.S.-Japan security relationship would be corrected within a short time. The target date was 1960, when the bilateral treaty would come up for revision—and the path to that date turned out to be more tortuous and contentious than anyone anticipated, as a succession of particularly provocative military-related incidents inflamed domestic hostility to the militarized U.S.-Japan relationship. This is the milieu in which the artists introduced here produced their protest paintings. The genesis of the so-called peace movement in postwar Japan actually dates to late 1949, when U.S. plans to turn Japan into a bulwark against Communism first became clear. Protest intensified when the terms of the secretly-negotiated security treaty were disclosed in 1951 and 1952, and grew even more intense in the several years that followed, as the concrete presence of an unexpectedly extensive web of post-occupation U.S. bases and facilities materialized. The presence of numerous U.S. military bases in post-Occupation Japan, coupled with fraternization of the foreign troops with Japanese women, drew critical scrutiny from many photographers, artists, and journalists in the 1950s. When the Americans finally relinquished direct control of Japan in the final days of April 1952, they left a mixed legacy of genuine friendship and goodwill on the one hand, and disillusion and hostility on the other. The latter erupted openly within days—on May 1, known ever since as “Bloody May Day”—when union-led demonstrators clashed with police in Tokyo in a day-long confrontation that left several protestors dead. One of the major issues that fired up the protestors was the militarized nature of the peace settlement. 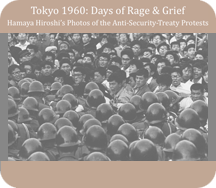 “Bloody May Day” marked the beginning of a near-decade of continuous, volatile anti-base and anti-remilitarization protests that culminated in massive demonstrations that convulsed Tokyo in May and June 1960, when the security treaty came up for renewal. Communists and non-communist leftists played major roles in many of these protests. What truly alarmed the Japanese government and its handlers in Washington, however, was the extent to which this movement fed on grassroots support—often stimulated by sensational events. One of the most galvanizing of these events occurred in March 1954, when a Japanese tuna-fishing boat named Lucky Dragon #5 was irradiated by fallout from an American thermonuclear (hydrogen-bomb) test at Bikini Atoll, located between Hawaii and Japan. The ship’s catch was contaminated, and it was widely feared that such contamination extended to other catches in the vast ocean area where U.S. nuclear testing took place. More shocking, all 23 of the Lucky Dragon’s crewmen developed symptoms of radiation poisoning, and the ship’s radio operator died of acute radiation sickness six months later. (“I pray,” he said famously near the end, “that I am the last victim of an atomic or hydrogen bomb.”) While the U.S. government tried mightily to cover-up the enormity of this tragedy, the response in Japan was a groundswell of anti-nuclear activism that included a petition calling for abolition of nuclear weapons that was reported to have been signed by an astonishing 30-million individuals, amounting to over half of Japan’s adult population. The Lucky Dragon #5, a Japanese fishing boat, was irradiated by fallout from an American thermonuclear bomb test at Bikini Atoll in 1954. Both the crew and catch were contaminated. The mid 1950s saw a nationwide surge in anti-base activity. One of the most dramatic and highly publicized of these protests, known as the Sunagawa struggle, arose in opposition to government plans to confiscate privately owned farmland in order to expand the runways at the already huge Tachikawa air field, on the outskirts of Tokyo. Beginning in 1955, student and labor-union activists joined local residents at Sunagawa, a town on the edge of the base, in a series of confrontations with police who had been dispatched to protect the government’s land surveyors. In 1955 and 1956, the well-known leftist film maker Kamei Fumio produced three documentary treatments of the Sunagawa struggle; and on July 8, 1957, this confrontation culminated in a riot that led to seven individuals being arrested and accused of trespassing on the U.S. base, which was a felony under the terms of the bilateral security arrangements. Between 1955 and 1957, the “Sunagawa struggle” pitted the police against local farmers protesting confiscation of their land to expand the runways at a U.S. base on the outskirts of Tokyo. 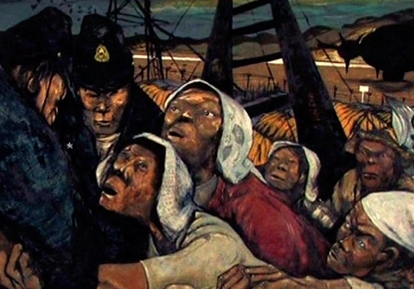 Nakamura’s reportage painting depicts an intense confrontation in late 1955. Six months before the Sunagawa confrontation peaked in the arrests of July 1957 and ensuing court case, a shocking base-related incident of a different sort galvanized anti-base sentiment nationwide. On January 30, an American soldier guarding a U.S. Army shooting range in Gunma prefecture shot and killed a 46-year-old mother of six who had trespassed on the firing range to collect spent shell casings, which she sold as scrap metal. This wanton act became known as the “Girard incident,” after the name of the shooter, and led to controversial legal proceedings as well as acute and often acrimonious tensions with the U.S., where public opinion was mobilized against the Japanese having any legal role in the disposition of the case. In the notorious “Girard incident,” a middle-age mother collecting brass shell casings at a firing range was deliberately shot by a U.S. guard. When Nakamura Hiroshi described the 1950s as a “civil-war era,” he obviously had these confrontations over the militarization of Japan in mind. He himself took both the Girard and Sunagawa incidents as subjects of his artwork, in two equally powerful but stylistically very different protest paintings. Militarization, however, was only one aspect of what Nakamura and his like-minded compatriots found disturbing and grotesque in post-occupation Japan. 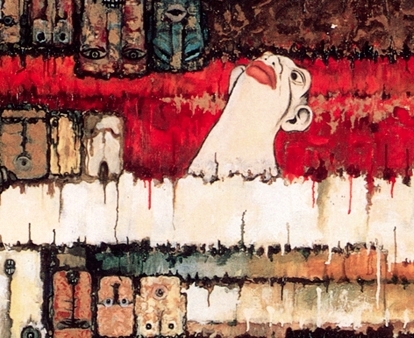 Commonly known as the “reportage painters” for their distinctive left-wing combination of realism and surrealism, these artists also called attention to social oppression and grievous poverty; to corruption, and the return of former militarists to high political positions; and to the “inhumane mechanism” of postwar society in general. suicide in an impoverished village. The unattractive head that dominates this work clearly depicts Kishi Nobusuke, who became prime minister in 1957 and negotiated the renewal of the security treaty in 1960. Kishi was imprisoned as an accused war criminal between 1945 and 1948, but never brought to trial.